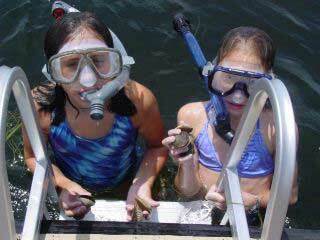 If you’re not into fishing, but would like a fun day out on the water, perhaps you should consider scalloping. This activity is especially fun for families. Snorkeling for scallops is typically in 3′ to 6′ feet of water. Water clarity is usually extremely good, and water temperatures between 84 to 88 degrees. It’s common to spot dolphin and other sea life on the way out to the scallop beds. DON’T MISS OUT! A secretive bivalve that spends most of its short life hiding in underwater grasses, the bay scallop is a prized dinner entree for many Floridians and an important component of the marine ecosystem. 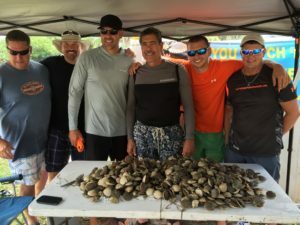 Although bay scallops historically were a valuable seafood commodity, declining populations in many coastal areas of Florida have prompted restrictions that now allow only recreational harvests. Scallops are highly sensitive to changes in water quality and therefore are an accurate barometer of an ecosystem’s health. Just as coal miners used canaries to detect waning oxygen levels or the presence of dangerous gases, the bay scallop provides an early-warning system for scientists monitoring the quality of Florida’s coastal waters. What is a bay scallop? The bay scallop is a member of the shellfish family known as bivalves for its two valves, or shells. Its upper valve is a dark mottled color, occasionally bright yellow or orange, and its lower valve is typically white. Bay scallops may reach a shell height of two inches and live two years, although in Florida their life span is generally only one year. The bay scallop feeds continuously by “vacuuming” or filtering small particles of algae and organic matter from the water. It does this by funneling water over open pathways called gills. One of these pathways takes in water and skims off particles, while another expels the filtered water along with digestive wastes. Scallops open their valves when feeding or breathing and close them when predators approach. The shell can also be slammed shut to avoid silt, which can clog the animal’s delicate gills. Many tiny blue eyes arrayed along the outer rim of the shell detect movement near the animal and serve as a warning system. When threatened, the scallop can swim backwards by clapping its valves and expelling water rapidly. Generally, most people eat only the large adductor muscle of the scallop. Scientists advise against eating the other parts unless the scallop is harvested from approved shellfishing waters, because these viscera may contain waterborne contaminants that can cause illness. A bay scallop has the remarkable ability to develop both male and female sexual organs; consequently, the scallop produces both eggs and sperm. An interval occurs between the release of sperm and eggs so that self-fertilization is unlikely to occur; this interval helps to prevent inbreeding. Development of the reproductive organs is influenced by the amount of food available and the surrounding water temperature. If too little food is present, the scallop will direct all its energy toward survival and will forego reproduction. A change in water temperature may trigger spawning. In Florida, spawning occurs in the fall when the temperature drops; although, elsewhere in their range, bay scallops typically spawn earlier in the year when the temperature rises. Each scallop is capable of producing millions of eggs at once, but the mortality rate is extremely high. Only one egg out of 12 million may survive to adulthood. In about 36 hours, the fertilized eggs become tiny larvae that float in the water for about 14 days before attaching to the base of seagrass blades. At this time, larvae are transformed into juvenile scallops, commonly called spat. The spat gradually move up the seagrass blades, out of the reach of bottom-dwelling predators such as crabs. But even then, survival is uncertain. As many as 90% of the spat will die within six weeks of latching on to seagrasses. Those that do grow large enough to avoid consumption by predators will eventually drop off and fall to the bottom, where they will remain the rest of their lives. Even as adults, scallops live a precarious existence. A variety of marine creatures, including blue crabs, stone crabs, and whelks, are able to pry the scallop shells open and extract the tender meat within. Sometimes the scallop can escape this fate by swimming away. Occasionally, the algae, tunicates, and other organisms that attach to scallop shells may conceal them from predators although this is not a reliable defense. One creature, the pea crab, manages to live in harmony with the bay scallop; this little crab finds protection within the scallop’s shells. While the pea crab does steal some food from the scallop, it doesn’t take enough to jeopardize the health of its host. scallops are very sensitive to changes in temperature and salinity. They are also vulnerable to changes in water quality. Water made cloudy by floating particles and ediments, referred to as turbidity, can clog the scallop’s gills. The scallop can close its shell to protect these gills for short periods but is unable to shut out the dirty water for more than about two hours.